A rich and vivid tale of fame, fortune and the sacrifices they demand, director Bill Condon’s electrifying adaptation of the Tony-winning Broadway musical was a triumphant success with audiences and critics alike. The Director’s Extended Edition includes 10 minutes of additional footage and represents Condon’s complete vision for the story of three singers who dream of stardom and learn the high cost of success. Set in the 1960s, singers Effie (Jennifer Hudson), Lorrell (Anika Noni Rose), and Deena (Beyoncé Knowles) are discovered at a local talent show by ambitious manager Curtis Taylor Jr. (Jamie Foxx). The trio known as “the Dreamettes” is soon offered the once-in-a-lifetime opportunity of opening for popular singer James “Thunder” Early (Eddie Murphy). Subsequently molded by Taylor and propelled into the spotlight as “the Dreams,” the girls find their bid for the big time taking priority over personal friendship, and begin to realize that the true cost of fame may be higher than any of them ever anticipated. 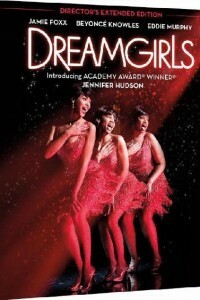 Dreamgirls features a stellar cast including Academy Award® winner Jamie Fox***, global superstar Beyoncé Knowles, Golden Globe® winner Eddie Murphy, and Jennifer Hudson in her breakout, award-winning role.